My girls really like to be in the kitchen only when they want to. It is usually when they want some sort of dessert or if I am planning on cooking something they don't like. Every time we plan on having something Amber doesn't like she will volunteer to cook and it is always tacos or burritos. Or if they have been having a very heavy school day (usually when doing Algebra) they like to bake something before moving to the next subject. 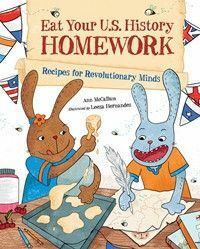 Lately we have been adding some US History to their cooking by using Eat Your U.S. History Homework from Ann McCallum Books. Eat your U.S. History Homework is a very cute colorful 47 page hardcover book available for $15.95. It is the newest book written by Ann McCallum and illustrated by Leeza Hernandez. It contains six scrumptious recipes from history, there are also kitchen tips, a history review, glossary, and an index. Ann is a teacher and has written several cookbooks that make history, science, and math more fun. This book covers events from history by using recipes that are from history or what historians believe people ate during that time period. A timeline of key events from 1607-1789 is included in the introduction. The recipes are from Thanksgiving, Colonial time, French & Indian War, Southern Plantation, Revolutionary times, and celebration of Independence. Each recipe is introduced with a page of history. Key words are in bold print and they are included in the glossary of the book. After each recipe there is another segment about history, and a section with other information from history called the Side Dish. There is a History Review at the end of the book. The recipe itself is divided into four sections. Before You Begin has relevant information about the recipe including the prep time, cooking time, total time, oven temperature when needed, the yield, and the difficulty of the recipe. Then there is a list of the ingredients needed, the equipment, and the method. The ingredients are separated in a list and the method steps are in a numbered list. All three of my girls read the book, but Alaina loves it. 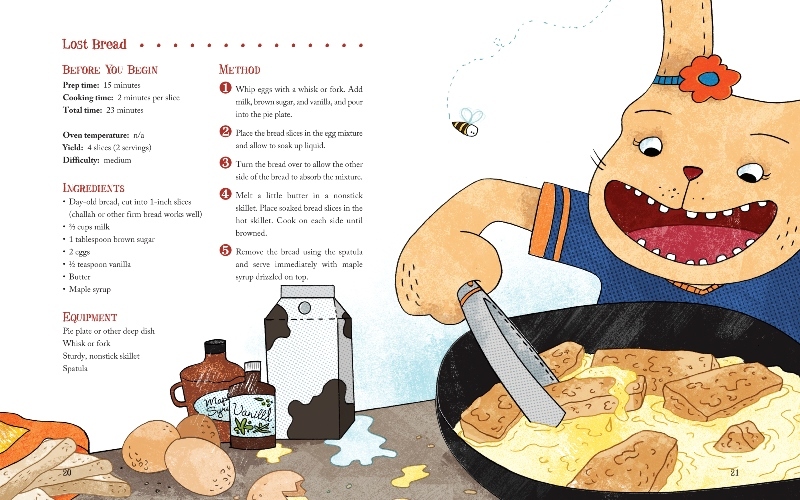 She loves when she has her own cookbook and when it is beautifully illustrated and easy to follow makes it even better. She loves the characters in the book and we have all enjoyed the recipes. Of course they all liked the sweet recipes, but Alaina loved the Southern Plantation Hoe Cakes the best. I really like this book, because it makes history fun, and it is important to see how our food and eating habits has changed over the years. The recipes are written in a easy way that my girls could follow without help. 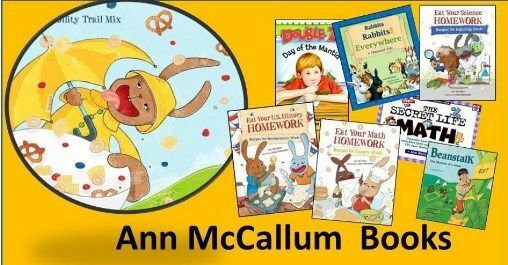 Ann McCallum is a high school teacher in Maryland, but she started her career teaching in a one room schoolhouse in Canada. Leeza Hernandez is a graphic designer and illustrate from New Jersey. Her art has been included in magazines, newspapers, and books. The Crew received several books from Ann McCallum and Alaina wants to get the other Eat Your..... cookbooks she has to offer. You can read those reviews on the Crew Blog by clicking the banner below.